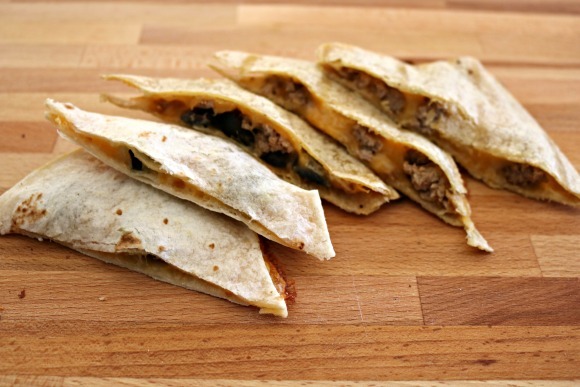 Quesadillas are a staple in our house. I’m not exaggerating when I say that we have them at least once a week. They’re a quick and easy dinner or lunch and they’re delicious. Strangely enough I’ve not made them while camping. I guess I didn’t really associate them with being a camping food. But after trying them out in the pie irons – they’re now on the camping rotation. They were awesome and easy! 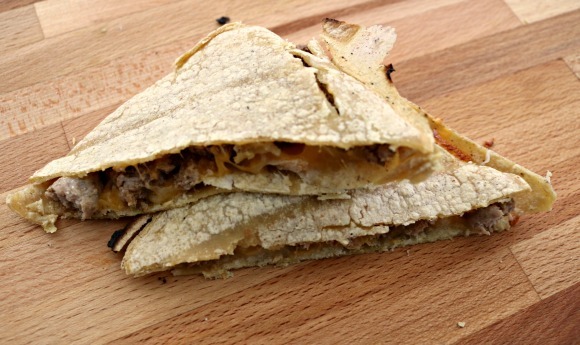 You really only need two ingredients to make a quesadilla – cheese and tortillas. Anything you add past that is up to personal preference. The only caveat is it has to be something that can tolerate high heat (i.e. no lettuce). 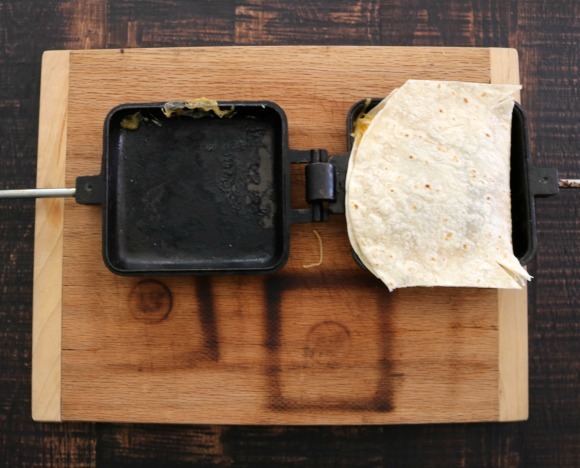 Each individual pie iron will make one small quesadilla. In our family of five – we ended up making 2 each for the adults and teenager and 1 each for the smaller kids. 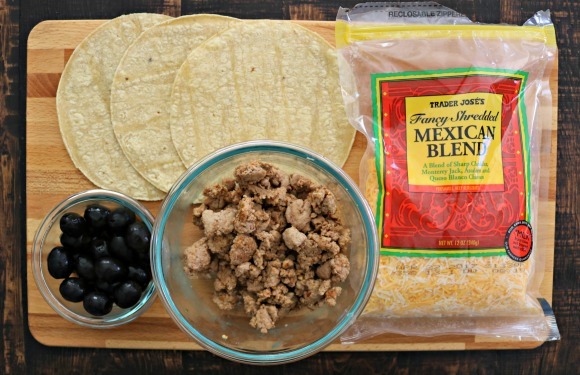 A word about corn vs flour tortillas – they both taste great! My kids usually prefer flour tortillas, but I really love corn. So I tried them both and they worked equally great. The corn reheats and crisps up nicely. The flour was a little easier to work with (due to the increased flexibility of the tortilla), but burns faster. I’d say give them both a try and see what you like best. Also bring some sour cream, guacamole, or salsa for dipping! 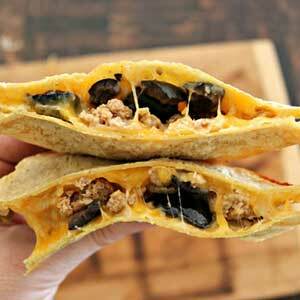 The prep you’ll do for this recipe is largely based on what you want to put in your quesadillas. If you didn’t buy pre-shredded cheese – make sure you shred your cheese. Dice your veggies and bag them into zip top plastic bags. Cook your ground beef, turkey, or chorizo, then cool and bag into zip top plastic bags. Remember to pack all of your ingredients into your cooler before your camping trip. First thing you’ll want to do is get your fire started. 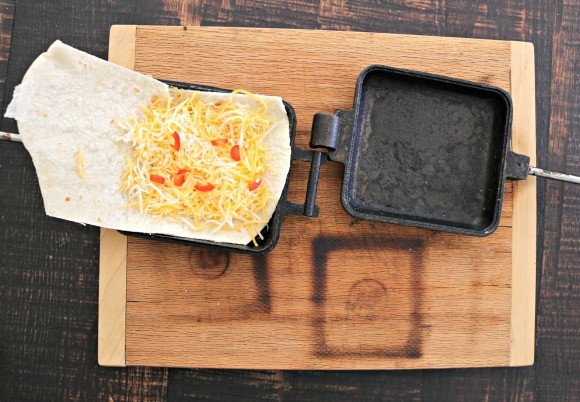 This recipe works great with wood, charcoal, or propane. No matter which you choose – get your fire started so you’ll have nice red coals, white hot briquettes, or a hot propane grill surface. Once it’s heating – go ahead and place your pie irons in the fire so they start to heat up. 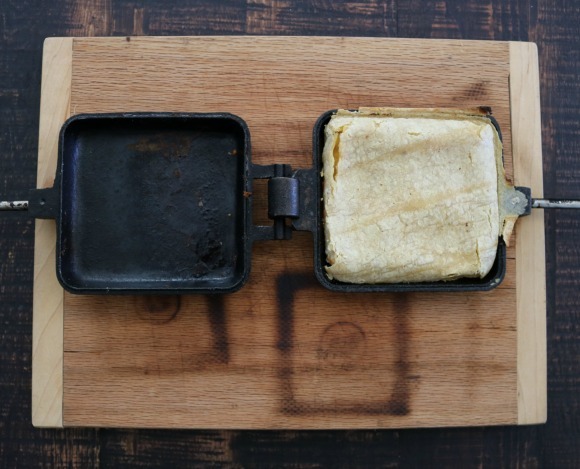 Hot pie irons equals faster, more even cooking. Grab those pie irons from the fire and get them situated for filling. In order to ease the cleanup of my pie irons (i.e. 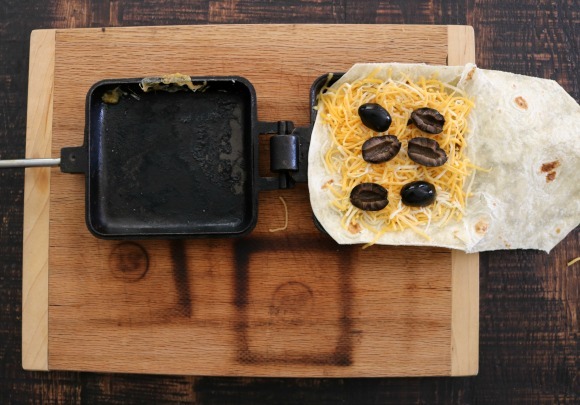 burnt on cheese is REALLY hard to scrub off at a campsite) – I like things to fit nicely into the pie iron. 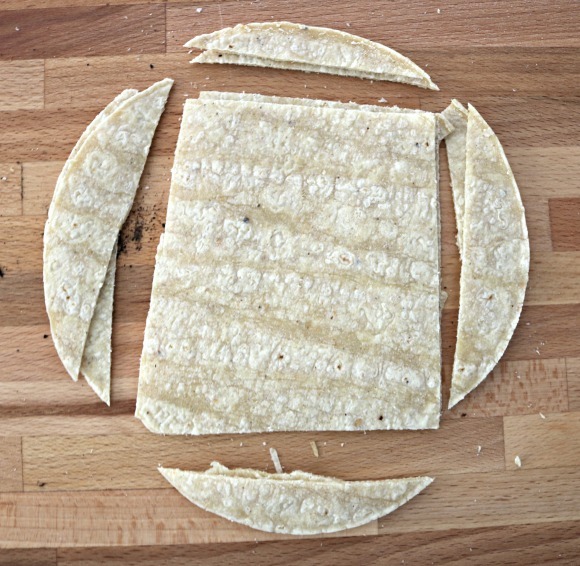 The simplest way to accomplish this with corn tortillas is to trim the edges off so they’re more square. The corn tortillas I used are the small taco size so I needed two to create the two sides to the pocket. Don’t worry about those edges – I hate waste so definitely couldn’t stand to throw them away. 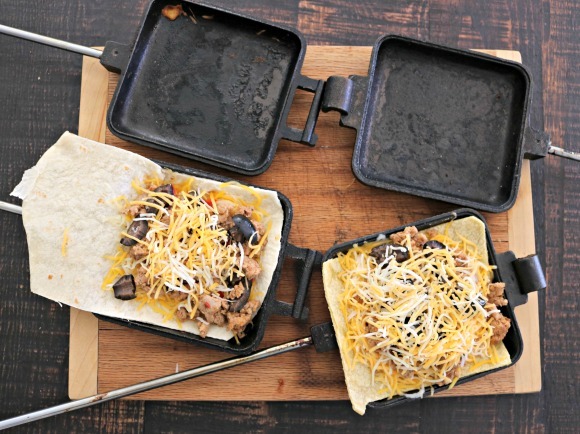 They’re delicious on top of taco, tomato, or tortilla soup cut into bits. So if you plan on having quesadillas and then soup the next night with the leftover tortilla bits – you’ll waste nothing. If you’re using flour – you’ll do less trimming (as you can see in the picture below). Flour is flexible enough that you can actually fold it in half and only trim 2 sides. Start with a layer of cheese as the base. 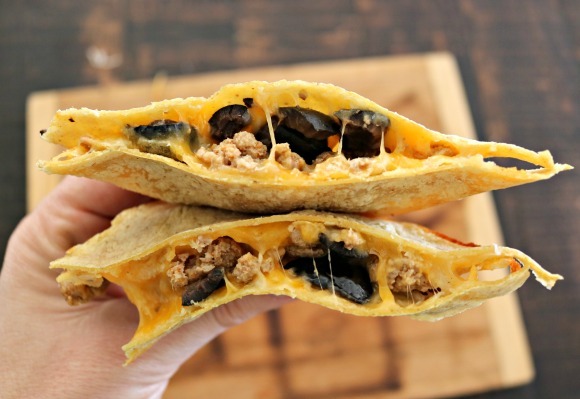 The trick is to place the cheese on the outside closest to the tortilla so it melts and creates a cheesy pocket of goodness. Now continue to layer your ingredients of choice. 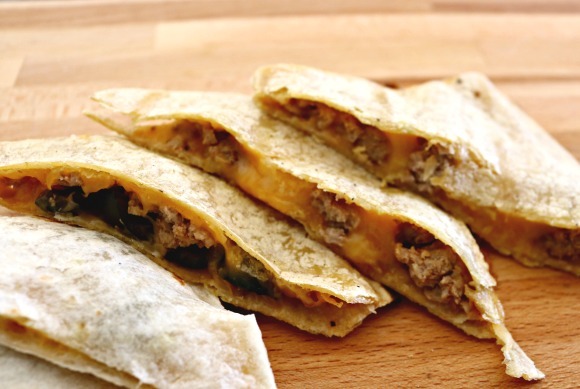 Always end with a cheese layer, then either fold over or place the second tortilla on the layers. Seal up your pie irons with the clip and proceed to the cooking area. Once your coals, briquettes, or grill are nice and hot, place the pie irons on them. Start with one side for about 3 minutes, then flip and cook for 2 more. 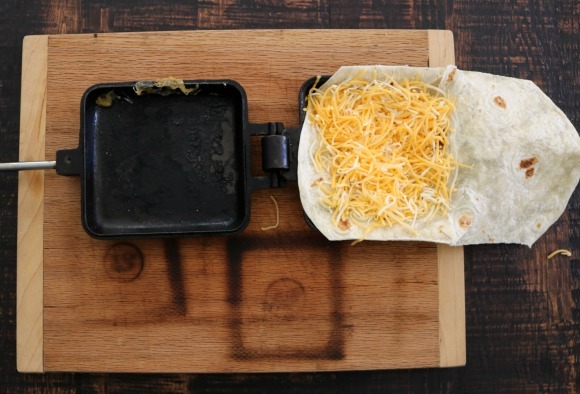 At this point check for doneness – you’ll want the cheese melted. Depending on how hot your fire is – you might have browning or you might not. You just want melty cheese! 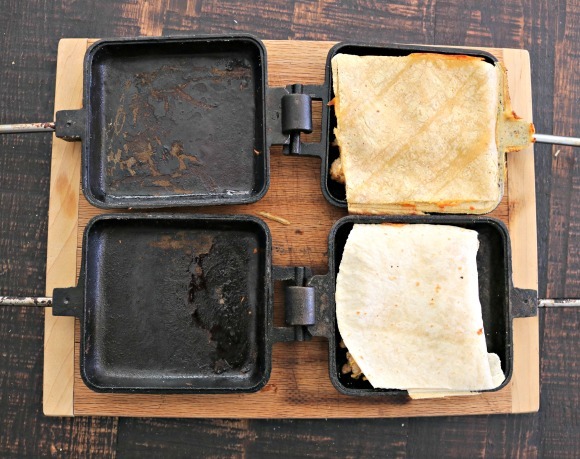 Below are the many faces of finished quesadillas. 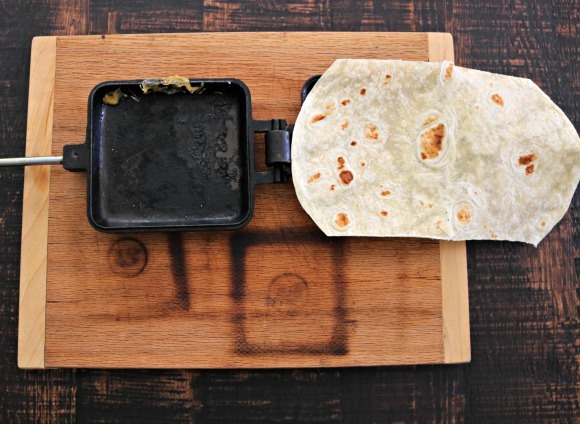 If you love quesadillas – give them a try in pie irons on your next cookout. They’re amazing!